A vast renewal event happens each spring as a wave of tiny plant growth covers the North Atlantic Ocean. This mass greening of the ocean's surface is observed dramatically from space by color-sensitive sensors on satellites as it extends from Bermuda to the ice edge in the Arctic during the season. 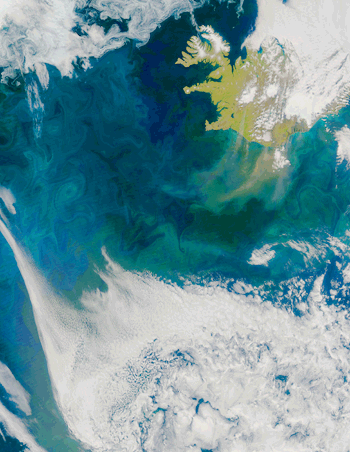 The phytoplankton of the North Atlantic bloom play a major role in pulling CO2 from the atmosphere and storing it in the ocean. Despite the magnitude and importance of this event, it has rarely been observed from start to end due to the difficulty and expense of maintaining ships in the region for many months. APL-UW investigators, their students, and colleagues from the University of Maine and Dalhousie University in Nova Scotia led an ambitious collaborative experiment in the North Atlantic near Iceland to coincide with the bloom in 2008. The challenge of the experiment was to characterized the bloom's temporal and spatial evolutions of physics, biology, and chemistry over its entire duration. 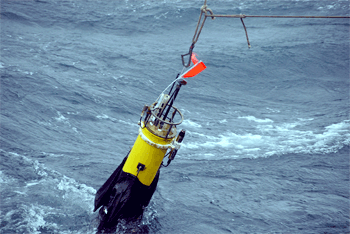 Almost all of modern physical oceanography is conducted by collecting data with electronic sensors. Biological and chemical oceanography may be, in part, following this example, though there are obstacles. New sensor technologies are not yet proven and the data collection efforts are complicated by the vast number of variablesthe diversity of life in the oceanthat must be sampled. For the North Atlantic Bloom program, Seagliders and Lagrangian mixed-layer floats, both developed at the Laboratory, were enhanced with new biochemical sensors. In addition to the standard temperature, conductivity, and pressure measurements, sensors for chlorophyll fluorescence, optical backscattering, beam attenuation, oxygen, nitrate, and light were distributed across the floats and gliders. In all, over 60 data channels were sampled to give a time-space resolved picture of physical, biological, and chemical properties. Instruments were deployed from the Icelandic vessel R/V Saemundsson in early April before the bloom began. The Lagrangian float followed the three-dimensional motion of water parcels within the ocean's mixed layer, thus measuring the actual motion and conditions experienced by a phytoplankton in the bloom. Four Seagliders were piloted (usually from APL-UW) in an array around the float to extend the horizontal and vertical range of the measurements. Their missions continued during a month-long R/V Knorr cruise in May, and on through the bloom's end in June when they were recovered. Every glider and float sensor was calibrated using shipboard sensors and/or water bottle samples collected on casts from the Knorr. To get the best calibrations, casts were performed within 500 m of the robotic platforms. This involved piloting the glider and float to park on the surface, maneuvering the ship as close as possible, and then making the cast as the autonomous platforms began a dive or profile. Some float and glider biochemical sensors measure proxy quantities for a variable, so complementary data collected by the ship's measurement systems were used. For example, an optical transmissometer on the float measures beam attenuationthe absorption and scattering of light due to particulate organic matter. To translate the optical float data to an estimate of particulate organic carbon due to phytoplankton growth requires shipboard water sample collection and laboratory analysis. The bloom began in the Icelandic basin on April 20 when the mixed layer shallowed rapidly to 520 m (the wintertime mixed layer is up to 250 m deep). Sensors showed rises in backscatter, beam attenuation, chlorophyll and dissolved oxygen concentration, and a decrease in nitrateall signatures of a phytoplankton bloom. As the diatom bloom peaked in mid-May, vertical profiles of beam attenuation and backscattering performed from the Knorr showed large spikes, increasing with depth over time, indicating that large phytoplankton were sinking to depth. Seagliders were instructed to extend optical measurements from 300 m to 600 m. The combined measurements yielded a detailed picture of this large carbon export eventa "diatom dump."